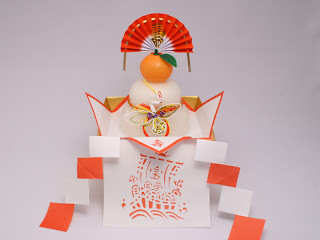 Kagamimochi is one of the customs for new years. between god and humans in Shintoism. After the offering, the kagamimochi was shared with many people. The sharing is not only eating, but also being happy through the year. Three kinds of items compose Kagamimochi. The first is an orange on the top. The second is two wheels of rice cakes (mochi). The third is a piece of white paper at the bottom. Some of the Kagamimochi are decorated with a folding fan, Kelp & lobster. "Kagami" means a mirror and "Mochi" means a rice cake. The rice cake is shaped like an ancient flat round mirror. That's the reason why it is called "Kagami mochi". It is covered by plastic to prevent mold. It is the best day to set up kagaminochies on Dec. 28th. Because, the eight is a lucky number in Japan. And nine is a bad luck number. We should keep it until Jan. 11th. and eat it as a Zenzai or Shiruko. Pretty cool site you've got here. Thanx for it. I like such themes and anything connected to them. I definitely want to read more soon. It is rather interesting for me to read the blog. Thanks for it. I like such themes and anything that is connected to them. I would like to read a bit more on that blog soon.